Nat Faxon and Jim Rash are actors turned writers and directors on their co-debut project The Way Way Back which is all about a young man's journey through a summer filled with awkward moments and learning experiences. Sam Rockwell, Steve Carell, Toni Collette, Maya Rudolph, and Liam James all star in what could be the comedy hit of the season. Duncan (James), a 14 year old young man who is still trying to get a grasp on who he is and what life is all about, has been forced into an extended summer vacation with his mom Pam (Collette), her boyfriend Trent (Carell), and Trent's daughter Steph (Zoe Levin). As they pull up to Trent's beach front property, it quickly becomes apparent that not everyone is looking forward to their time together. While the adults are hoping for a little private time together, the kids don't want anything to do with each other or their respective parents. After deciding he has had enough of a dysfunctional situation that keeps getting worse, Duncan finds himself hiding out at the local water park as often as he can. What he didn't expect was to be hired by the manager Owen (Rockwell) who has decided to mentor what he sees to be a very lost and awkward, yet strangely familiar, kid. Under the guidance of an adult who has never been quite ready to grow into a man, Duncan finds himself growing into a young man who isn't quite ready to be an adult and, what started out as the summer vacation from hell, is quickly turning into one he will never forget. For a heartfelt comedy like this to work, you need three very important things to fall into place. The story has to be very well written, the actors need to be as genuine as they are funny, and the audience has to believe in the reality that all of the characters are placed in. Fortunately, this movie excels in all three areas as you quickly get caught up in these people's strange but glaringly familiar lives. Sam Rockwell is especially good in a performance that achieves a delicate balance between what was given to him on the page and what I'm sure came bursting out of his brain while the cameras were rolling. Other standouts are Allison Janney as Betty, the drunken next door neighbor who doesn't leave anything to the imagination when it comes to what's on her mind and Liam James as Duncan who does a great job of evolving his character from an introverted boy who everyone picked on to a break dancing, wisecracking, confident young man over the course of the movie's 103 minute running time. I'm not a big fan of Steve Carell and he did nothing here to change my and it would have been an improvement to see someone like Aaron Eckhart play a character who is more mean spirited than the wacky funny guy Carell is known for. While not a perfect movie by any means, it is also not bad at all for a first time effort from the creative team of Faxon and Rash and I am definitely looking forward to what they might have in store for audiences in the future. 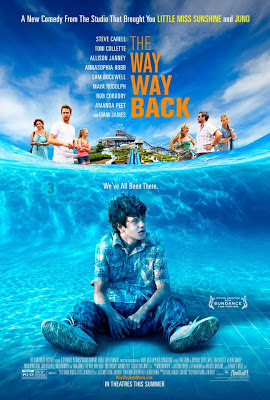 The Way Way Back isn't quite on the level of becoming the type of classic comedy that will be watched over and over again for years to come, but the cast and crew does just about everything right in creating a movie that you will be very happy you took the time to see.